One of my favorite Peanuts' cartoons is where the gang is sitting in a row, heads down, baseball gloves in hand. It's obvious their team lost the big game with discouraged looks on everybody's faces. The pain of that loss is so intense no one dare say anything, and the silence remains until the fourth and final frame. Finally, Lucy speaks up and says, "That's okay Charlie Brown. Anyone can make 22 errors in one inning." Recently I stopped to talk with the maintenance crew that tends the common area near our home. "I've never seen the place look better," I said. "Keep up the good work." One of the men, somewhat startled, replied, "Thanks. No one ever says anything like that to us." My guess is a lot of workers, all over the organizational chart, including CEOs, go through daily routines receiving little, if any, encouragement. The kind of support that might boost morale or provide additional incentive to finish a difficult task. In addition to 360s, annual reviews, and project post-mortems, everyone could benefit from a little more inspiration throughout the year. One online dictionary says that encouragement is "the action of giving someone support, confidence, or hope." Perhaps "action" is the operative word in that definition. Encouragement is different than "happy talk." A cheerful remark might be helpful but tends to be short-lived. On the other hand restoring someone's confidence, with carefully chosen words, can be a profound moment, and potentially life-changing. No suggestion is being made to remove personal responsibility for doing what needs to be done. Work is work. Yet offering support at an appropriate moment might make it possible for a friend, co-worker, or family member to keep going when faced with challenging circumstances. Nor is this a call to pull back from instruction and necessary correction. Both are needed from time to time. Sub-par performance is a way to jeopardize one's job and needs to be identified and dealt with as soon as possible. However, inserting the right words at just the right time and place can make a big difference in an individual's personal or professional life. The truth be told some are gifted at this while the rest of us need more practice. One way to look at the depths of Ford Motor Company's problems is to track the price of its stock. Maybe you were one of the prescient few who purchased Ford shares when they bottomed out at $1.01 on November 20, 2008. As of this post Ford's stock is just over $17 per share. That's nearly a 1,600 percent return on investment. According to the Wall Street Journal, Ford made $1,683 in operating profit per vehicle in the third quarter of 2013 up from $1,335 a year earlier and raised its full-year operating-profit forecast to more than $8 billion, ahead of 2012. The single biggest factor in that report may be the decision by William Ford, Jr., now executive chairman and great-grandson of founder Henry Ford, to step down as CEO and bring in Alan Mulally from the Boeing Corporation to head up the company. Mulally helped lead the turnaround of the commercial airline division at Boeing and was looking for a new challenge when chairman Ford came calling in 2006. It proved to be the right decision as Ford, along with General Motors and Chrysler, nearly went out of business during the Great Recession. From 2006-2007, Ford lost $30 billion alone. GM and Chrysler filed prepackaged bankruptcies with the United States government (taxpayers) providing funds to keep the two automakers alive. Ford, which also received tax subsidies and incentive packages, chose not to go into bankruptcy instead mortgaging nearly all its assets, including the blue Ford Oval, for $23 billion. Alan Mulally refers to that transaction as "the largest home improvement loan in history." What were the other factors which kept Ford from its near-death experience? There was Mulally's four-point plan which he preached often to anyone who would listen. The board of directors. The management team. The investment community. The union workers. The Ford family. The salaried employees. And suppliers. "Mulally's plan was predicated on a sweeping transformation of Ford's entire product portfolio," according to Bryce Hoffman in his book, "An American Icon." Other factors include instituting the now famous Thursday Business Plan Review meetings in the Thunderbird Room at Ford's World Headquarters in Dearborn, Michigan. This process worked for Mulally at Boeing. He found this form of accountability to be effective in keeping the plan on course, sharing knowledge, monitoring problem areas, and making timely adjustments. The meetings, which continue to this day, are an example of how practical leadership development can be. Alan Mulally would be the first to say he was not alone in this effort. In fact, it took hard work and sacrifice on the part of thousands of employees, a narrowed list of suppliers, support from the board and Ford family, as well as luck to pull off this "Motor City" miracle. Not to be overlooked are Ford's customers who purchased the new and improved vehicles, making everything else possible. There were two additional components of the turnaround that need to be mentioned and should not be underestimated in contributing to Ford's success. ﻿﻿﻿﻿﻿﻿﻿﻿The first was Kansas-born Mulally's trademark smile. It hardly ever disappeared from his face, even in the darkest moments of the crisis, according to those who worked with him. And there was intelligence, experience, and toughness to back up the grin. The second was being the CEO--"chief encouragement officer." From the beginning of his tenure in 2006 Alan Mulally promised his team that the ride back up from the bottom would turn out to be "a lot of fun." His primary means of motivation, according to Hoffman's book, was a shared vision. Mulally would hug people in the hallway telling them they were going to make it if they would stay together and follow through on the plan. It's not surprising that a cult of personality has developed around the Ford CEO. Says, Hoffman, who had access to Ford leadership in writing the book, "Men and women stand and cheer him when he enters the room. They blush when he hugs them and shyly ask for his autograph. After all Mulally helped save Ford, and their jobs." 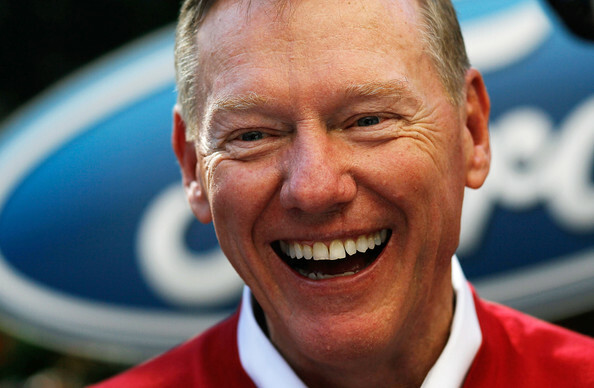 In all this adulation Alan Mulally never ceased talking about the "team" and the importance of being "One Ford." Do you know anyone short on support, confidence, or hope? I'm sure you do. Whatever the need, listening carefully and offering encouraging words may be one of the better gifts you can give this holiday season. Acting to help, not just talking, is the ultimate display of caring and generosity. "In everyone's life, at some time, our inner fire goes out. It is then burst into flame by an encounter ﻿with another human being. We should all be thankful for those people who rekindle the inner spirit." So observed medical missionary and Nobel Peace Prize winner, Albert Schweitzer. Be encouraged--and give thanks for those who lit the flame in your life. And consider doing the same for somebody else.